Club Fontana in Vaasa is full of people in strange outfits: tight skiing pants, short figure skating skirts and ice hockey equipment… What can possibly be happening? But when everybody starts making familiar rhythmic sounds and the toastmasters begin to sing Helan går, the answer is clear. 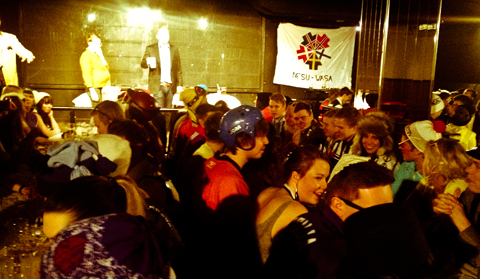 It’s the 1940’s Winter Olympics in Germany –themed sits-party organized by NESU-Waasa! ← When life gives you lemons, make a tequila!